Our team are highly experienced in delivering high quality commercial interior design and installation that suits the needs of your business, whether you are looking to refurbish your office, showroom or shop or you are looking to completely re-fit your premises. 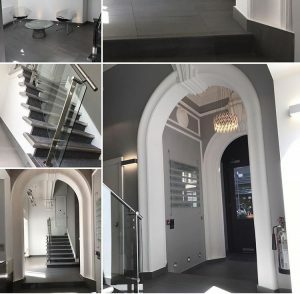 We are able to provide solutions for your interior design scheme such as replacement ceilings, wall partitioning, glazing, exterior and interior signage, shopfronts, flooring and carpeting, network cabling, air conditioning and electrical installation. All of these aspects are completed by our team of experts who will take great care over every job. We work closely with some of the UK’s cutting edge architects and designers, bringing their ideas and schemes to realisation. We can also offer a complete project management service where we oversee the whole job from the initial design stage through to completion of works. “I have worked with Premier fitting since 2009. Throughout this period I have found them to be honest, hard working and reliable. They have always delivered on time and within budget, whilst works progress the communication and attention to detail is very good, they keep me fully informed on progress.